On Sunday, we decided that we would take a trip in to DC and go to the Smithsonian National Zoo. I am nowhere new to riding the Metro. Growing up, my grandparents lived a little farther from DC than we do now. Whenever we would visit in the summer, we would always make a trip into DC to go to one of the Smithsonian museums and would always take the Metro. Now that I'm an adult and a mom, it's a little different. We travel to the Vienna, VA station to get on. In the future there will be stations closer to us. On the weekends the parking is free, but during the week there's a parking fee of $4.75 for the day at the location we go to. To see all the different stations you can go to, click here. There are machines at each location to purchase your ticket. Beware that if you're purchasing a paper ticket there is a $1 charge per trip or $2 round trip. We had read it wrong and only put the $1 charge on each of our tickets. It's easy enough to fix, there are machines to add money on to your ticket. The downside is that they don't take credit/debit cards like the other machines. Oh, and the attendants don't have cash to break any large bills. We were lucky that the guy let us go without putting that extra $1 charge on my ticket (I had only one $1 bill on me and no change). Children four and under get to ride the Metro for free. Since we live so close to DC and possibly will be travelling in more often, we are thinking about possibly getting the SmarTrip Cards. For more information about fares for the Metro, click here. Michael was so excited and wanted to get on the "Choo Choo Train". This was not his first time on the Metro, but it had been close to two years since he had been on it. We kept him in the stroller until the train got to the station. We folded up the stroller so as to not take up too much room in the train. The Metro can get pretty crowded. This trip, we ended up riding backwards which was probably a weird feeling for Michael. He seemed to enjoy it though. To get to the zoo from where we started, we had to get off the orange line and then get on the red line. Jon held Michael's hand and I lugged the stroller around the station where we switched lines at. I was so happy that Michael, even though he was looking all around and inspecting the place, did not try to run off. There are two stops you can take to get to the zoo. We took the Cleveland Park stop since it's a flat walk, the other is all hill. Once we got up to ground level and in the sun, we opened up the stroller and Michael sat while we walked. To see the map of the Metro, click here. We did have an incident on our way back. The train doors closed right before I could get on. Jon looked worried, but it didn't faze me. I knew that there would be another one to get on in the matter of minutes. The doors reopened and I was able to get on with Jon and Michael. Make sure everyone knows what all the stops are that you need to take and hold the hands of your little ones tightly. When we went with Michael the first time, he was 14 months old. We took pretzel sticks to have him chew on to help with going underground. It helped a whole lot. This time, it didn't seem to bother him. 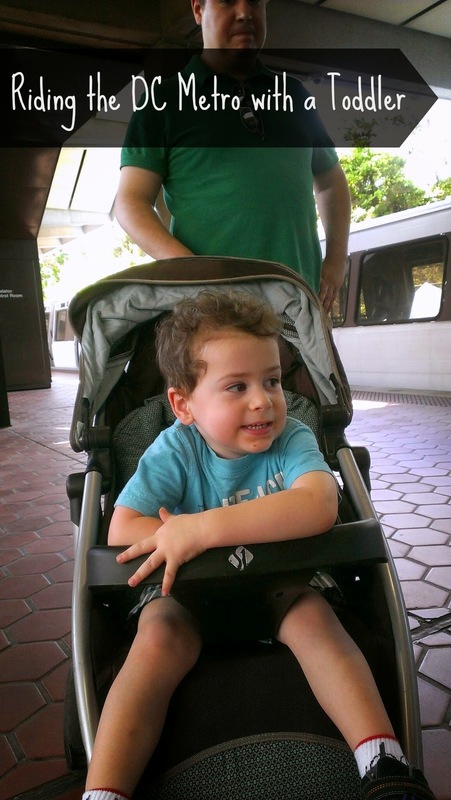 Have you gone on the Metro with a toddler? If so, what suggestions do you have? Stay tune for my post about the Smithsonian National Zoo. Hi! While you were there, did you ride the bus with your toddler as well? Was it also a fairly simple experience? Thus trip we did not ride the bus. We did ride the bus on another trip, but that was because of the Metro train was closed for stretch of track. It wasn't too bad.